Many years ago in the far away land of India, in a place called Indostan, there lived six blind men. Though they were blind, they were known to be wise beyond their years. People came from miles away to talk about their problems and to discuss important issues with the blind men and usually left with the wisdom that they sought. Though to most people, the men seemed calm and serene, not a day passed without arguements among them when they were alone, about the wisdom they possessed. They talked and argued and argued and talked until they all agreed on answers that people sought. One day in the wee hours of the morning, before the usual crowd of visitors came by, the men were finding their way along a jungle path talking. As they talked, a loud trampling noise could be heard coming down the path towards them. One of the wise men said, "I hear an elephant nearby. We have often talked about these beasts, but we have never agreed about what they are like. Let us go and touch the creature and debate about who is right and who is wrong." So each of the men walked along the path until they could sense the elephant nearby. Elephants can be very dangerous animals. For when they smell man, they often become upset and fearful. They have been known to charge at people and trample them to death. However, having never seen the size and power of an elephant, the blind men walked calmly up to where the animal stood. It did not move from where it stood until they had all touched it and learned as much as they could about it. The first blind man was very tall, but as he approached it, he started to fall. As he fell forward, his hands came to rest on the side of the magnificant animal. He moved his hands up and down and from side to side until he was absolutely certain what it was like. He stretched his arms up and felt high, then leaned over and felt lower. He stretched his hands out to the left and to the right and felt the same hard surface the entire time. His fingers felt the tough, leathery skin with dried mud clinging to it like pieces of masonry on the sides of a house. Then satisfied, he began to call, "I've learned the elephant is just like a wall!" The second blind man also found the elephant. However, what he found was entirely different. He was near the front of the elephant, and as he reached out with his hands, the elephant turned his head slightly to watch him, and the blind man's hands came to rest on the elephant's tusk. The man felt the round, smooth surface of the elephant's ivory tusk. He stretched out his fingers and tried to wrap them around the surface that he felt. Near where the tusk began, it was too large to reach totally around with his two hands. As he moved his hands down the tusk, away from the elephant, his fingers could touch. He continued to feel until he reached the end of the tusk where it came to a point that was slightly rounded at the tip. "Goodness me, it's very clear, the elephant is really like a spear." The third blind man walked directly into the path where the elephant was. He could sense the closeness of the elephant and held his hands out in front of him as he approached it. His approach aroused the curiosity of the elephant, and it reached out with his trunk to feel the man and see what he was like. 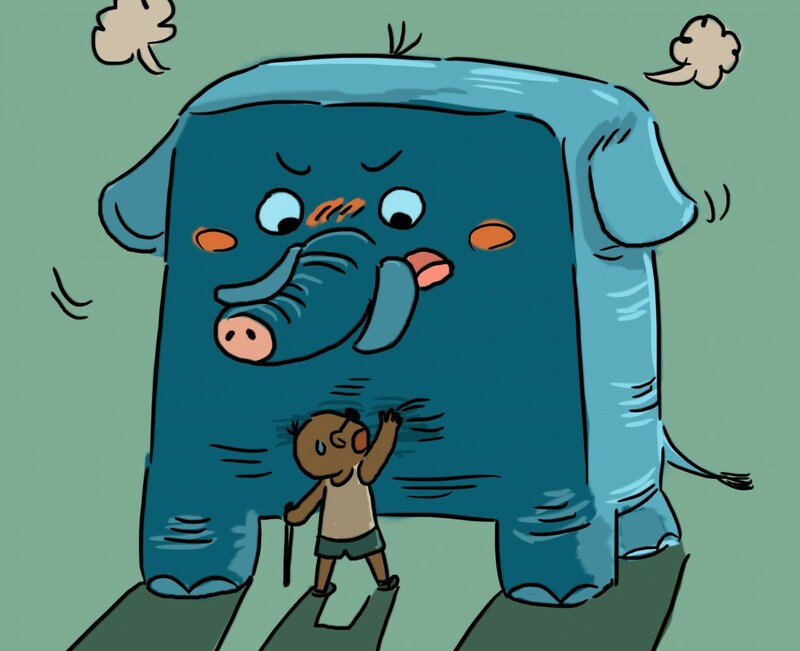 As the man's hands wrapped around the trunk, the elephant moved the trunk from side to side. It curved around the man's hands, letting the man scratch and massage it's trunk. Before the man backed away, the elephant touched the man on his cheek with the tip of his trunk. "The only opinion I can make is the elephant is like a snake." The fourth blind man was somewhat short and happened upon the elephant's leg with his hands. He touched the elephant's knee and reached around it. His hands found that the leg was round and rough. He allowed his hands to travel from the knee to where the leg touched the ground. Then, he moved his hands back up with caution until they branched out where they hit the body. He shook his head up and down after picturing his image of the elephant. He said, "The answer's really clear to see. The elephant is like a tree! The fifth blind man listened to the comments of the others and stood still the entire time - not having touched the animal yet. As he stood near the elephant, he suddenly felt a bit of wind brush past his face. He could hear a slight sound of something moving back and forth in front of him and reached up with his hands to find the elephant's ear. It was thin enough that his forefinger and thumb could almost touch while pinchng it. Yet, it was large from top to bottom and side to side. As he continued to try to hold the ear, the elephant whipped it from side to side stirring up a breeze. "I know the answer," said the man. "The elephant is like a fan." The sixth blind man had walked past the elephant and only found it by hearing the comments of his friends. As he came up on the back side of the elephant, it flicked his tail back and forth. The tail hit the man on the nose. He instantly shot his hands forward and grabbed the swinging object that had hit him. It was long and thin, with a tuft of hair at the end. That sixth blind man tried to pull the tail he held in his hands, and the elephant tooted. The man made a horrible face when he smelled the air. The man said, "I know I must sound like a dope, but the elephant is like a smelly rope. The argument went on for ages. Each man was certain that he alone knew what an elephant was like. So it goes with wisdom. Even the wisest of persons can be partly right and yet be mostly wrong.